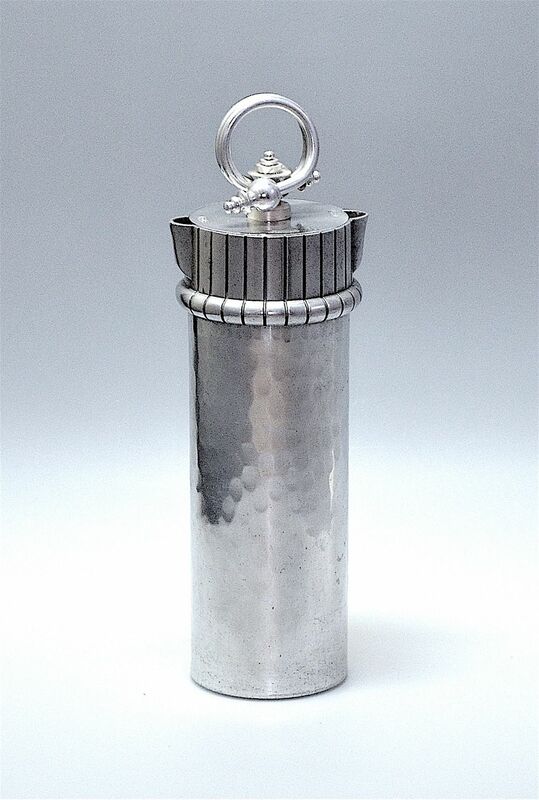 This fabulous hammered aluminum cocktail shaker was made in America during the period 1930-1950 by the Fredrick Buehner-Wanner Company. Modelled as a tall cylinder that ends in a ridged section with two spouts. The deep lid has a very attractive double ring handle with shell like finials with a tiered conical centre. The lid is marked in 4 places - the 2 words "Pour" are opposite each other and the 2 words "Shake" are also opposite each other. The lid twists so that when the words "Shake" are adjacent to each spout you can shake without fear of being covered in the contents and when the words "Pour" are adjacent to each spout you may empty the shaker. The base is partially marked with the Fredrick Buehner-Wanner Company marks. A really great object that would work will with the other Fredrick Buehner-Wanner Company piece on the site particularly if you used that as an ice pail.